The objective of scenario training is for the team to identify and respond appropriately to patients with clinically urgent health needs, and by using a systematic approach, optimise their outcome. These medical emergencies are managed using the NZRC evidence based national guidelines. All team members have a specific role to play when responding to a medical emergency. Scenario training is designed to meet the team’s needs in your work place, enhancing confidence, knowledge and skills. It is a great team building exercise which focuses on communication, familiarity of emergency procedures and equipment. We run emergency scenarios for larger or smaller businesses – group size is not a barrier. For scenario training to be most effective, we suggest 1 instructor for no more than 6 participants. This allows greater participation and creates a better opportunity for experiential learning for all members of the team. Do you feel prepared for a medical emergency in your workplace ? Our recent adventure has been to offer valuable emergency scenarios training to small businesses throughout our community. These scenario can be relevant to all businesses such as cafes, restaurants, hair salons and offices. 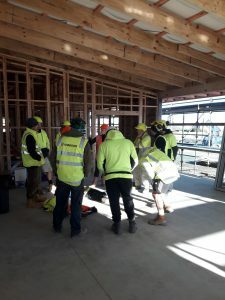 We offer on-site training for your team, so that the team can develop confidence and skills when faced with an emergency in your place of work. This scenario training is designed for your unique working environment, discussing relevant and realistic emergencies that may occur. It is a hands-on practical session to help you recognise and respond in a timely and safe manner with clear communication and team work. The New Zealand Dental Council recommends a six monthly practice review, involving all staff, of the management of medical emergencies to ensure an appropriate and coordinated emergency response. We are flexible in aiming to meet your needs for your training, so contact us for more information and discussion and/or book a training session. Prices are a guide for scenario training. They may also need to take into account larger group size, travel, venue (if not in your workplace) and set up time. The guys had a great morning today with the lovely ladies from Resus. We had two groups of nine with 2-3 first aiders in each group, the ladies then went on to explain DRSABCD and then on to two scenarios involving trauma and a collapse, whilst telling us some interesting stories. The environment that we did it in was great as subbies and other workers were still working in the area so it made it a real world scenario with distractions you would have before the hooter is sounded.The guys had nothing but great feedback and praise towards the training and everyone learnt some valuable tools to use in the event that we have an accident on site that requires some first aid. More so now that everyone has had a chance to learn and not just the guys put on the normal first aid courses. Another point the guys made was the benefits of having the training outdoors and onsite rather than in a air conditioned class room with all the paper work which not everyone learns easily from. The ladies did talk about a certificate they could give out to those that attended and we could file that under everyone's competency records.